My foray into yoga is relatively new. In an attempt to help never ending back problems while improving strength and flexibility, I’ve been determined to get the hang of it. The only problem is, my flexibility is non-existent. This has definitely been a challenge and I am constantly left in awe of what some instructors can do. Part of getting into yoga and a daily stretching routine has been buying some extra gear and equipment. Apart from the right clothing, a non toxic yoga mat has been my main purchase. When looking for a mat, I was intrigued by the big range of prices and types. Shouldn’t a mat be a pretty standard, straightforward item? Turns out it’s not and as a I looked into it further it, I found there is quite a difference in materials used in yoga mats. These range from synthetics through to more natural, non toxic materials. For me, the thought of going to all the trouble to improve my health and then rolling around on a synthetic chemical laden mat just didn’t make sense. Not to mention the chemicals you can breathe in as well. If you are interested in a non toxic yoga mat and why it is a better choice, read on. I also suggest a few natural mat options for you. Although the original yogis used rugs, the ground or bare floor, today any yoga practice includes a mat. 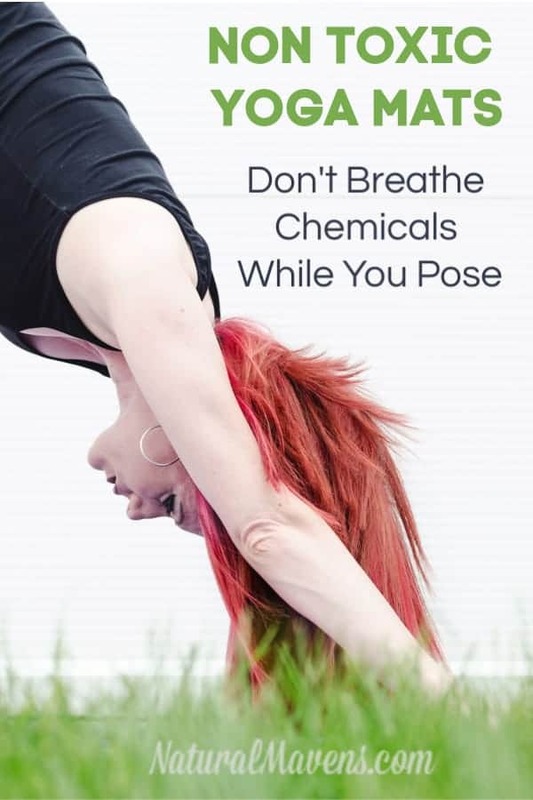 And standard yoga mats are toxic, to you and/or the environment, because of the material used to make them. For a long time PVC was the main material used for yoga mats. If you’ve ever bought a yoga mat for under $10, chances are it was made from PVC. Not only is PVC cheap, it gives the mat grip. This was seen as a big benefit if you get sweaty and slippery during your routine. But the downside of PVC (poly vinyl chloride) is it’s full of toxins like phthalate, chlorine and bisphenol (BPA). This is why it is also known as The Poison Plastic. Needless to say, it is not the ideal material when to come in contact with while exercising. Read more on why it is a health concern. With the toxicity of PVC now recognized, manufacturers have looked for alternatives that are more affordable and safe. Enter TPE or thermoplastic elastomer. TPE, while still a synthetic, is considered a ‘safer’ alternative to PVC. Toxins like phthalate and BPA are removed plus it is recyclable. Definitely a better option, but still synthetic. 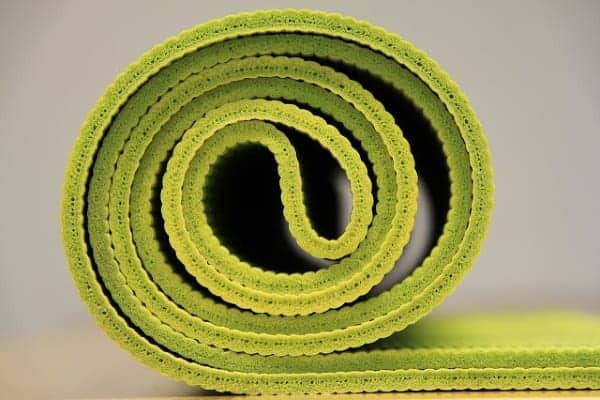 The last ‘chemical’ used for yoga mats is PU or polyurethane. It is considered non-toxic and safe, but can’t be recycled and is not biodegradable. Choosing a yoga mat made from any of these materials is not ideal if you are looking to minimize exposure to toxins. They are also definitely not the best choice for the environment. Let’s take a look at some less toxic, more natural options. Not just for wine bottles, cork is a natural, eco-friendly material. It is growing in popularity as an option for yoga mats for many reasons. Naturally anti-microbial, it won’t get moldy or smelly, even for the heaviest sweater. It also doesn’t slip (although it looks like it will) which makes it perfect for hot yoga. Lastly, cork just looks natural and earthy giving it the perfect ‘vibe’ for yoga. There is synthetic, man made rubber, and then there is natural rubber. Made from the latex sap collected from rubber trees, it is an eco-friendly and recyclable material. Natural rubber yoga mats offer a soft, flexible, non toxic alternative that is easy to clean. Plus, you can get them in a range of colors so they will match your studio, home or exercising space. Jute is a strong, rough fibre used in a wide range of textiles and fabrics including hessian sacks and floor coverings. More recently it has become an eco-friendly, non toxic option for yoga mats. On its own, jute can be coarse, rough and provide little grip. To overcome this, it is meshed with PER (Polymer Environmental Resin) to give cushioning and grip. I love the rustic look of jute yoga mats which is why I chose this one. Like me, you now know that not all yoga mats are equal. There is a range of materials used in the manufacture of yoga mats, and some are far from desirable. If you are going to make the effort to improve your health and take practice yoga regularly, it is a wise decision to invest in a non toxic yoga mat. Choose from one of the eco friendly materials listed above to suit your needs. If you are after the best grip that withstand lots of sweat – go with a cork mat. For the softest, non toxic option, natural rubber is the pick. And if you want a long lasting mat that looks great, jute is ideal.